Hartford, CT…Permatex®, a leading innovator in chemical technology for automotive maintenance and repair, has introduced ScrewGlue Repair Gel as the perfect solution for homeowners to alleviatethe frustrations caused by loose screws and bolts around the house. Permatex ScrewGlue Repair Gel quickly fixes damaged and stripped screws and threaded holes in household items by restoring their holding power and preventing the parts from loosening. Permatex ScrewGlue Repair Gel restores the holding power of damaged or stripped screws, bolts, and bolt holes that become worn or weakened due to frequent use. Permatex ScrewGlue Repair Gel eliminates the frustration of constantly re-tightening a joint or assembly. It utilizes a non-drip, clinging formula that makes it ideal for use overhead and hard-to-reach places. Permatex ScrewGlue Repair Gel also helps prevent screws and bolts from future loosening due to vibration, frequent use, thread corrosion, and exposure to the elements. 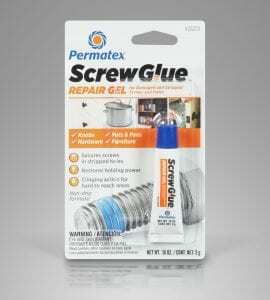 Designed as the perfect addition to any ‘junk drawer’, Permatex ScrewGlue Repair Gel can be used anywhere around the home on a variety of repairs such as cabinet knobs and handles, furniture screws, pot handles, hinge screws, door handles, and sports equipment. Plus, if disassembly is ever needed, applications with ScrewGlue Repair Gel can be disassembled with standard hand tools. ScrewGlue Repair Gel is one of three innovative solutions in the Permatex ScrewGlue line, which also includes ‘ScrewGlue Multi-Material’ for connecting screws, bolts and nuts of different materials; and ‘ScrewGlue Locks’ for increasing the holding power of metal nuts, bolts, and screws.